Careful attention must be paid to the physical characteristics of any apparatus being specified. There have been many cases where new apparatus had difficulty fitting in the fire station. The first step in acquiring new fire apparatus is to determine the operational needs of the department. This is not always as simple and straightforward as it seems. Often the apparatus that is being replaced no longer efficiently of effectively meet the needs of a changing community. For example, a rural community with limited volunteer personnel, relatively long responses, and good apparatus accessibility might consider a quint to service its response area, whereas an urban department with tight streets, traffic congestion, closely packed buildings, and an abundance of emergency medical service (EMS) runs might find that a rescue-pumper is a more suitable choice. In both of these cases, the primary operational concept will dictate some of the design features of the replacement apparatus that will more suitably meet their needs. The following 10-step needs assessment should help narrow the selection process and get the committee on its way. The primary apparatus designation must be given careful consideration as the requirements of the standard change accordingly. For instance, you could have a pumper with an aerial device or an aerial apparatus with a pump and tank. Either rig might not meet the requirements of a quint. Each of the types mentioned have different requirements. What other major functions are required of the apparatus? Some departments require pumpers to perform a secondary function as rescue apparatus, commonly referred to as a “rescue-pumper” or be equipped with a large water tank that some call a pumper-tanker. What are the physical characteristics or limitations of the new apparatus? Overall height, width, length, and wheelbase measurements are extremely important—especially where limited station dimensions exist. Some other considerations might be a greater angle of approach or departure or additional ground clearance. What additional features are required on the new apparatus? An onboard generator, light tower, cord reels, oversize compartments, large hosebed or water tank, foam system, and class- A or -B or compressed-air foam systems are just some of the features that might be included. How many riding positions are required? The number of seating positions in the cab will have an impact on the front axle and tire ratings as well as the cost of supplying and mounting the seats. 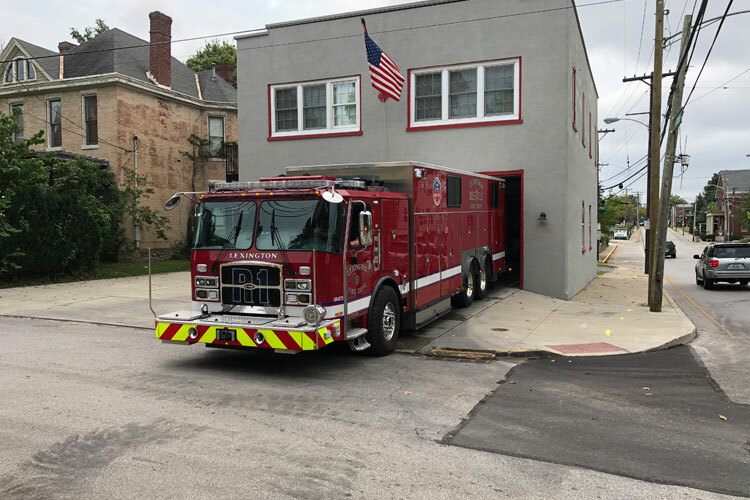 Some volunteer departments make the mistake of specifying a 10-person cab that results in seat overcrowding when they are fortunate to roll out with four firefighters on a normal day. What special operating conditions must be met? Depending on the apparatus loading and local conditions, extra axles might be required on heavy apparatus such as aerial towers, mobile water supply apparatus, and rescue apparatus. Some areas require four-wheel-drive apparatus or special suction or discharge capabilities. Typically, operating in excess of 2,000 feet above sea level or at ambient temperatures outside the 32°F to 110°F range need to be specified. What equipment is to be supplied and or mounted by the manufacturer? The only new equipment that must be supplied by the manufacturer is either 15 feet of supply hose or 20 feet of suction hose on apparatus equipped with a fire pump and new ground ladders. Other new equipment or mounting requirements need to be considered. What is the activity level of the new apparatus? Depending on whether the apparatus will be in a busy or slow location or possibly even used occasionally as a hazmat unit might dictate whether a custom or commercial chassis would be more appropriate. Are there any special operator requirements? Apparatus such as tractor-drawn aerials, industrial foam apparatus, and telescoping/articulating apparatus might require extensive operator training and qualifications. What is the approximate funding is available? It would be nice if unlimited funding was available, but typically that is not the case. One way some deal with this is to make two lists: absolutely necessary and nice-to-have items. For instance, some specify 2½-inch discharges on both sides, front, rear, and preconnects. The price of a discharge includes, valve, plumbing, gauge, and installation. These can be costly additions, especially when they are just located for convenience. Answering these ten questions can quickly narrow down the design of the apparatus. It is also important to remember that specifying and designing fire apparatus is a series of decisions, compromises, and trade-offs. Sometimes, either because of cost or design, you can’t always get what you desire. WILLIAM C. PETERS retired after 28 years with the Jersey City (NJ) Fire Department, having served the past 17 years as battalion chief/supervisor of apparatus. He served as a voting member of the NFPA 1901 apparatus committee for several years and is the author of Fire Apparatus Purchasing Handbook, the apparatus chapters in The Fire Chief’s Handbook, and numerous apparatus-related articles. He is a member of the Fire Engineering and Fire Apparatus & Emergency Equipment editorial advisory boards and the FDIC International executive board. I agree!! Decide what task you want the truck to perform and stick with it. I have been involved with a number of truck purchases for our fire department. What do you want the truck to do, what equipment do you want on the truck, Weight each piece of equipment. For one truck the guys built ply wood cabinets to the measurements of the truck we had spaced out, then they placed the equipment in the mock up cabinets to make sure everything would fit….before they started to build the truck. Ten great rules to follow!! The only problem I see , the truck in the photo does fit into the Station . It is a very busy Rescue in Lexington Ky and is housed ot of that Station . Very misleading photo.